Due to its policies and alliances, the Syrian PKK affiliate, the Democratic Union Party (PYD), is increasingly drawing more frustration and anger from different Kurdish parties in Syria, Iraq and Turkey. 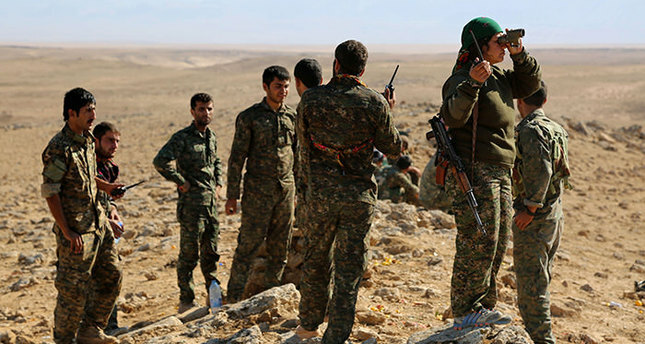 Coming to the fore and supported by Washington and Moscow, as the People's Protection Units (YPG) militia fights against the DAESH terrorist organization, the group prevents Kurdish opposition parties from voicing political dissent. Recently, the PYD blocked 6,000 Syrian peshmerga fighters who were trained in Iraqi Kurdistan and were attempting to return to Syria. The Turkish government had allowed peshmerga fighters from the Kurdistan Regional Government (KRG) in Northern Iraq to pass through Turkey to join the fight against DAESH in Kobani in October 2014. The KRG peshmerga units played a significant role in rebuffing DAESH offensives. Iraqi Kurds have said that the PYD cannot be considered a group that represents all Kurds in Syria and that the group's legitimacy has declined for them. The PYD has forced 13 Syrian Kurdish parties to leave PYD territory. All of these parties are represented in the Syrian National Coalition that supports the territorial integrity of a free Syria. In order to hinder the opposing voice from the KRG and Iraqi Kurds, the PYD banned Iraqi Kurdistan's Rudaw Media Network from operating in Kobani and the surrounding area last week. The PYD made a statement regarding the decision and defended its policy, saying: "The decision will be in place unless Rudaw changes its politics." Speaking to Anadolu Agency, Mustafa Shafik, an advisor of the KRG prime minister, said that the "PYD has become part of [Bashar] Assad's regime [and has] cut relations with Kurds and some other allied countries." He continued: "The [PYD] organization signed a strategic agreement with the Syrian regime. It has been working on applying it for four years. They have strengthened their presence in the Kurdish areas in Syria by [the enforcement of] de facto policy." Kava Azizi, a member of the Kurdish National Council, believes the PYD is an extension of the Assad regime and that the "Baathist regime controls this organization [PYD] according to its own interest." Azizi pointed to the permanent U.N. representative in Syria, Bashar Jaafari, who announced that PYD is part of the Assad regime. Following a closed-door U.N. Security Council meeting on Feb. 17, Jaafari said: "These Syrian Kurds supported by the American administration are also supported by the Syrian government." In December, Assad gave an interview to the U.K.'s The Sunday Times newspaper in which he said that the regime supplies arms to the PYD. PYD Co-Chair Salih Muslim said in an interview with Al-Hayat magazine in July that they could allow the return of Syrian regime forces to Rojava and that the YPG will join forces in a certain case. Ridwan Badini, an academic from Salahaddin University, believes that the PYD's policy in Syria has not been welcoming to the entire Kurdish community. "The organization does not represent most Kurds in Syria," he said. Azizi said: "Syria's Kurds are not satisfied with the PYD's policy because it seeks to destroy the Kurdish struggle in Syria while other Kurdish parties are working to build a better future." Syrian Kurdish academic Dr. Mustafa Muslim, known for his opposition to policies followed by his brother Salih Muslim, said in an exclusive interview with Daily Sabah in January that Russia uses the PYD as a tool against Turkey. Refuting recent claims by PYD supporters that Ankara acts against Syrian Kurds, Muslim asserted that Turkey has been in solidarity with Syrians in general, and with Kurds in particular, at this critical moment in the Syrian civil war. Muslim, originally from Kobani in northern Syria, currently lives in Turkey's southeastern province of Gaziantep and works at the city's Zehra University. In an interview published in the Al-Araby Al-Jadeed daily, a KRG military official said that the PKK and PYD are making the fight against DAESH more difficult for KRG peshmerga forces. A peshmerga commander, Qassem Shasho, said that his forces had to postpone plans to liberate Sinjar, a strategically important location in the region, from DAESH because of the PKK presence in the area. Shasho told the daily that they had hoped to launch an attack against DAESH in the beginning of November, but the PKK and PYD prevented the planned attacks.